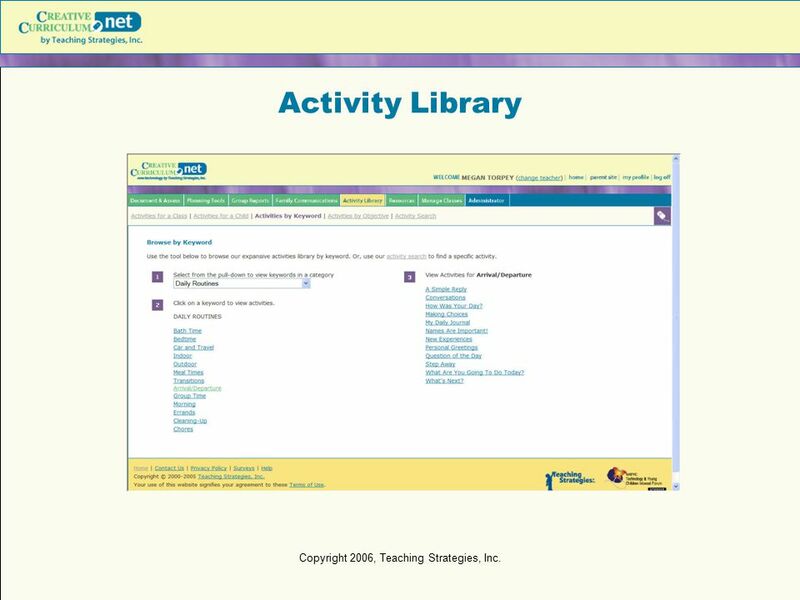 Copyright 2006, Teaching Strategies, Inc.
2 Copyright 2006, Teaching Strategies, Inc. 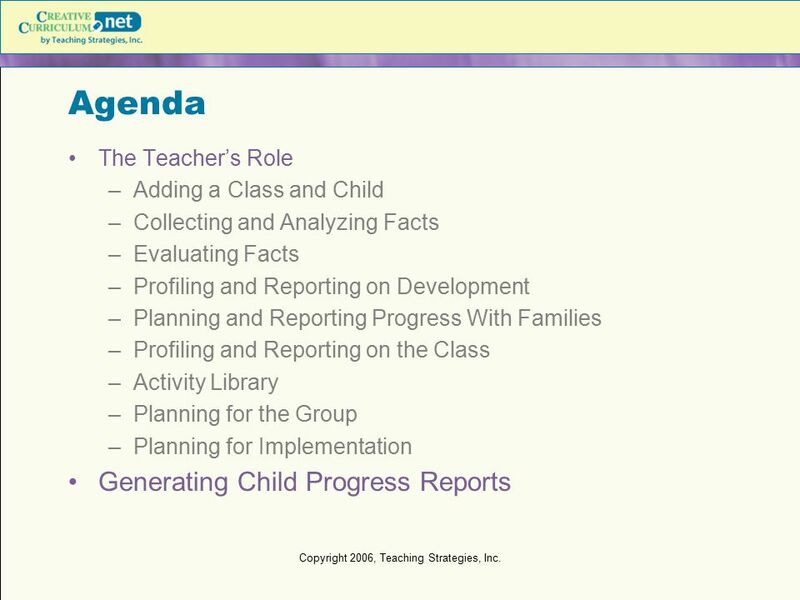 Agenda The Teacher’s Role Adding a Class and Child Collecting and Analyzing Facts Evaluating Facts Profiling and Reporting on Development Planning and Reporting Progress With Families Profiling and Reporting on the Class Activity Library Planning for the Group Planning for Implementation Generating Child Progress Reports Copyright 2006, Teaching Strategies, Inc. 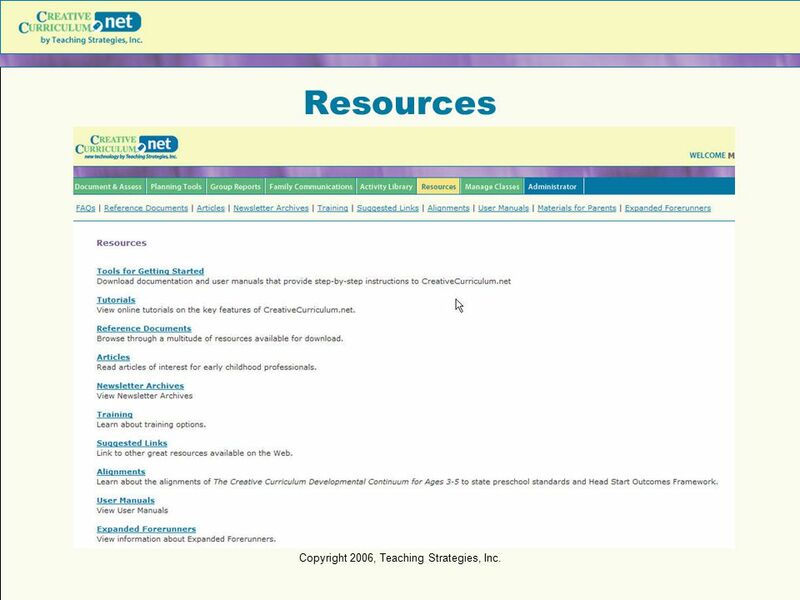 Located in Resources Section Keep them handy Updated often as new features are added Searchable online manuals Copyright 2006, Teaching Strategies, Inc.
4 Copyright 2006, Teaching Strategies, Inc. 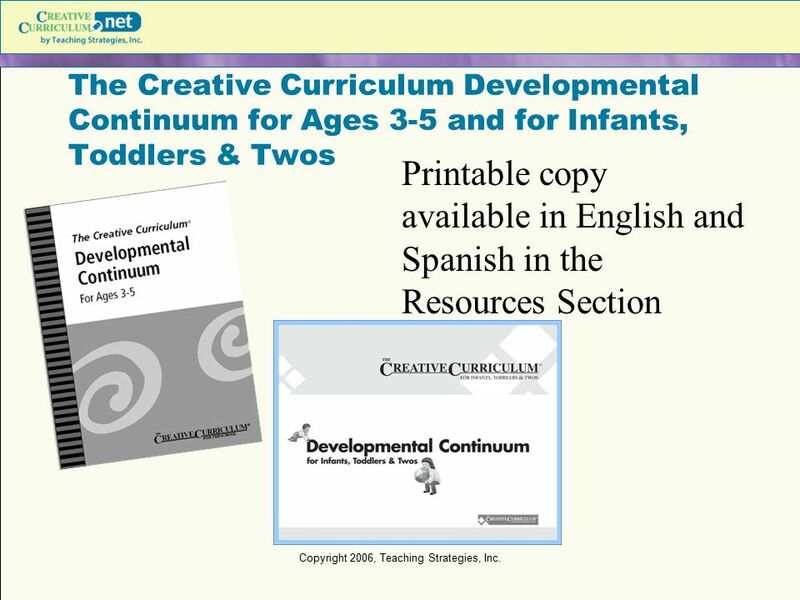 The Creative Curriculum Developmental Continuum for Ages 3-5 and for Infants, Toddlers & Twos Printable copy available in English and Spanish in the Resources Section Copyright 2006, Teaching Strategies, Inc. 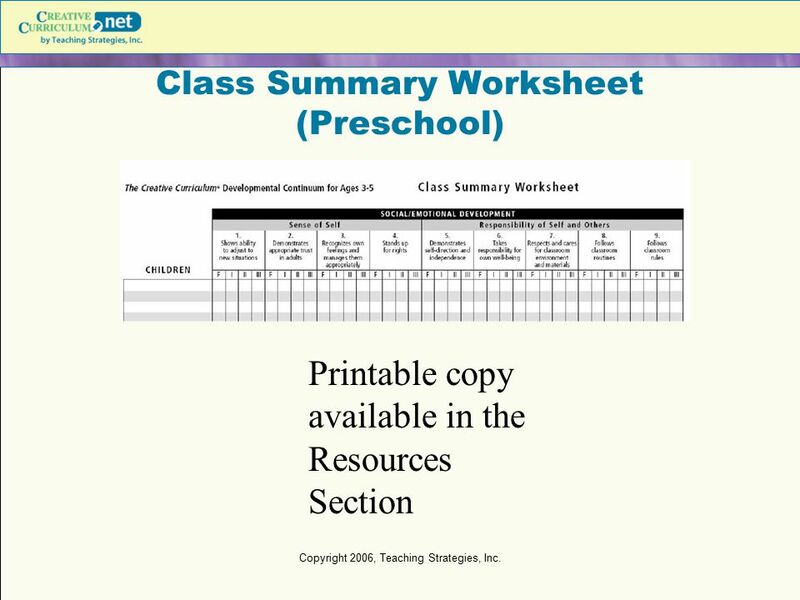 Printable copy available in the Resources Section Copyright 2006, Teaching Strategies, Inc.
6 Copyright 2006, Teaching Strategies, Inc.
HELP! 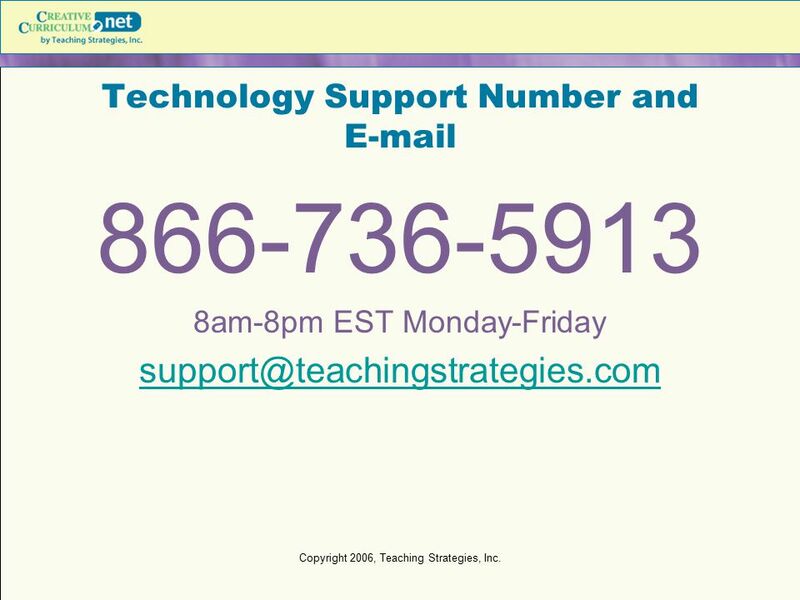 At the bottom of the screen, click “Contact Us” Copyright 2006, Teaching Strategies, Inc.
8am-8pm EST Monday-Friday Copyright 2006, Teaching Strategies, Inc.
8 Copyright 2006, Teaching Strategies, Inc.
Searchable FAQ’s Copyright 2006, Teaching Strategies, Inc.
9 Copyright 2006, Teaching Strategies, Inc. 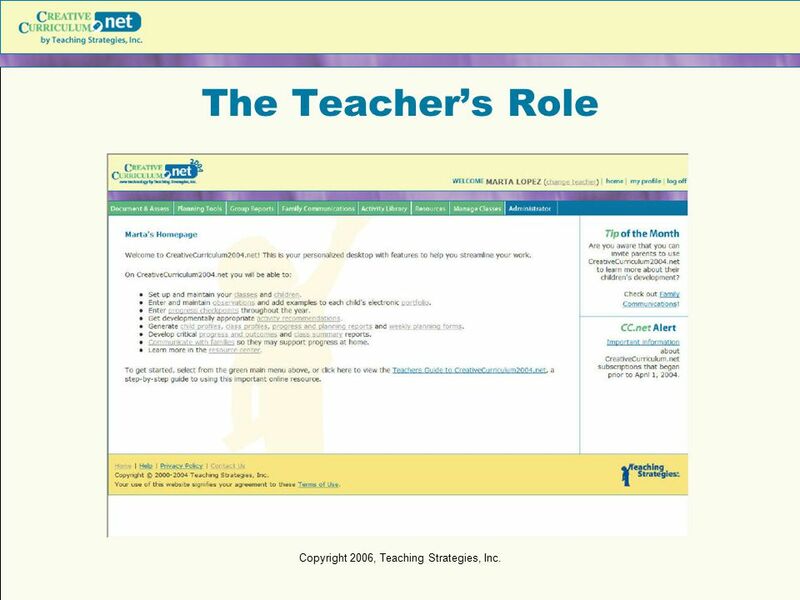 The Teacher’s Role Copyright 2006, Teaching Strategies, Inc.
1. Collecting facts 2. Analyzing and evaluating what you learned 4. 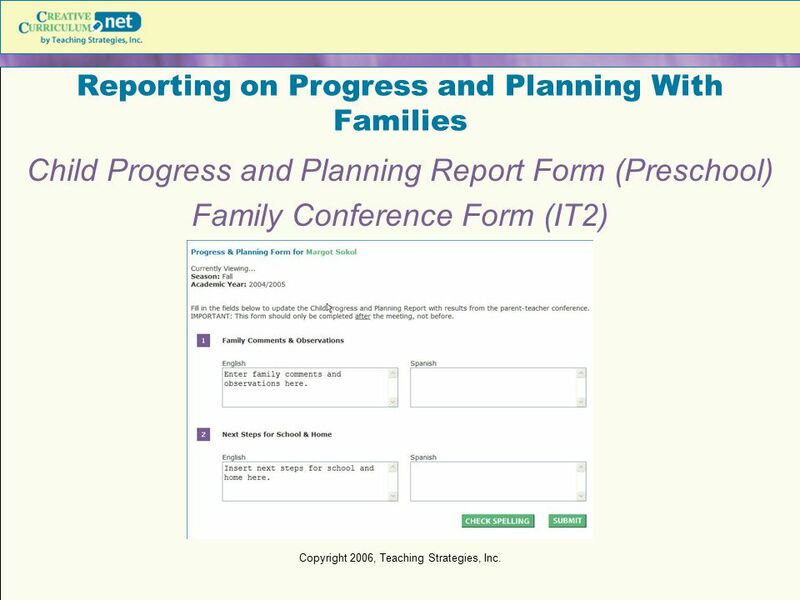 Reporting on children’s progress 3. 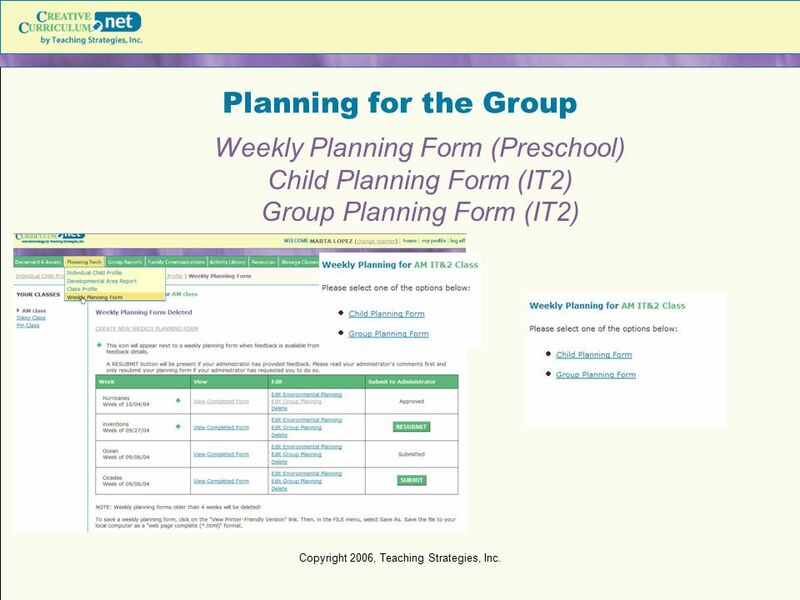 Planning for each child and the group Copyright 2006, Teaching Strategies, Inc. 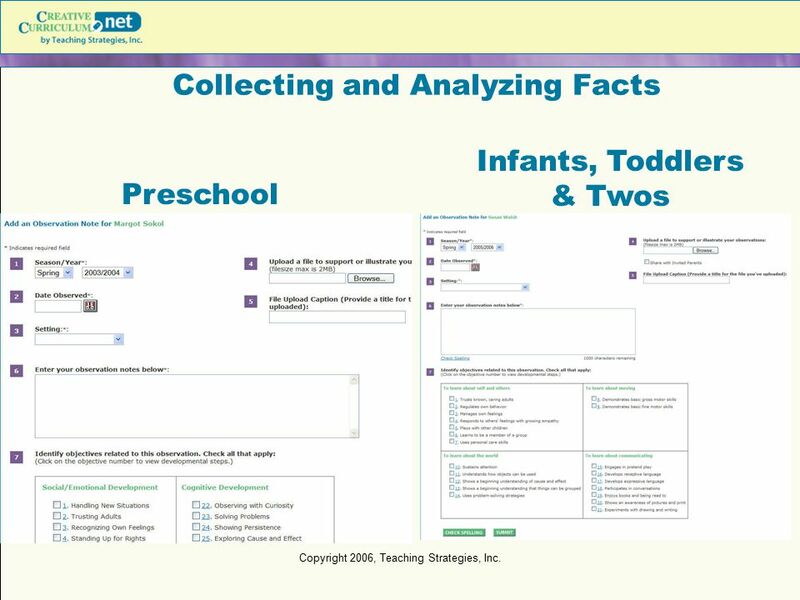 Infants, Toddlers & Twos Preschool Copyright 2006, Teaching Strategies, Inc.
13 Copyright 2006, Teaching Strategies, Inc. 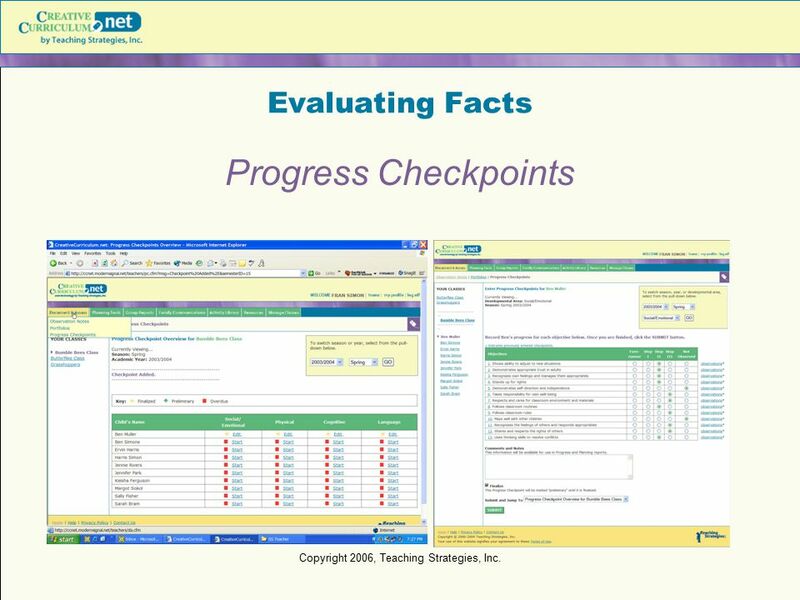 Evaluating Facts Progress Checkpoints Copyright 2006, Teaching Strategies, Inc.
14 Copyright 2006, Teaching Strategies, Inc. 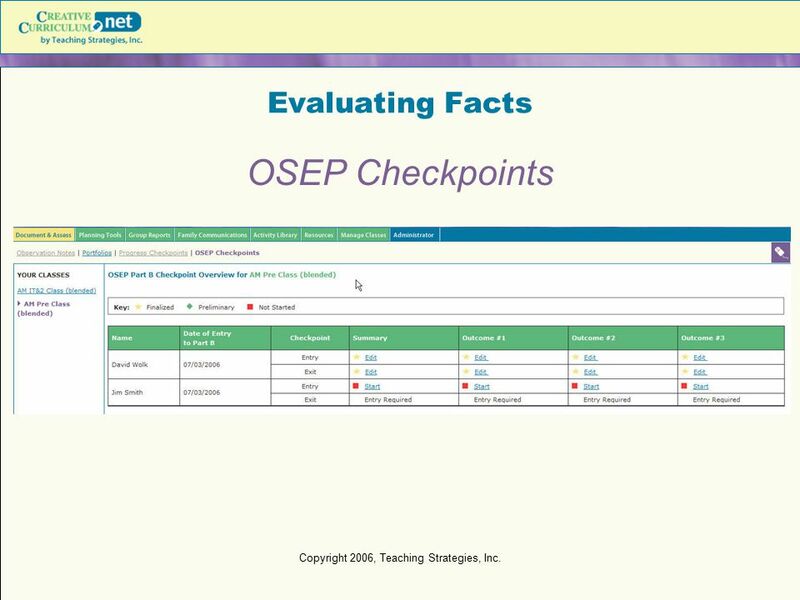 Evaluating Facts OSEP Checkpoints This slide is only to be used for schools using assessments other that creativecurriculum.net Copyright 2006, Teaching Strategies, Inc. 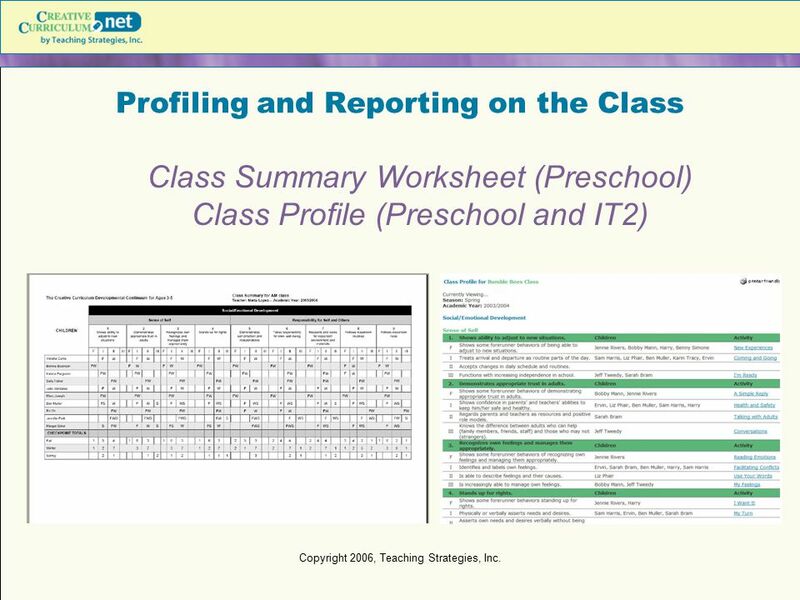 Individual Child Profile Developmental Area Report (Preschool) Development Report (Infants, Toddlers & Twos) Copyright 2006, Teaching Strategies, Inc.
Child Progress and Planning Report Form (Preschool) Family Conference Form (IT2) Copyright 2006, Teaching Strategies, Inc.
Class Summary Worksheet (Preschool) Class Profile (Preschool and IT2) Copyright 2006, Teaching Strategies, Inc.
18 Copyright 2006, Teaching Strategies, Inc.
Activity Library Copyright 2006, Teaching Strategies, Inc.
Child Planning Form (IT2) Group Planning Form (IT2) Copyright 2006, Teaching Strategies, Inc.
20 Copyright 2006, Teaching Strategies, Inc.
Resources Copyright 2006, Teaching Strategies, Inc.
Download ppt "CreativeCurriculum.net Teacher Functionality"
Chapter 30 Early Intervention Overview Rationale for early intervention services Principles of early intervention Services and supports available for early. 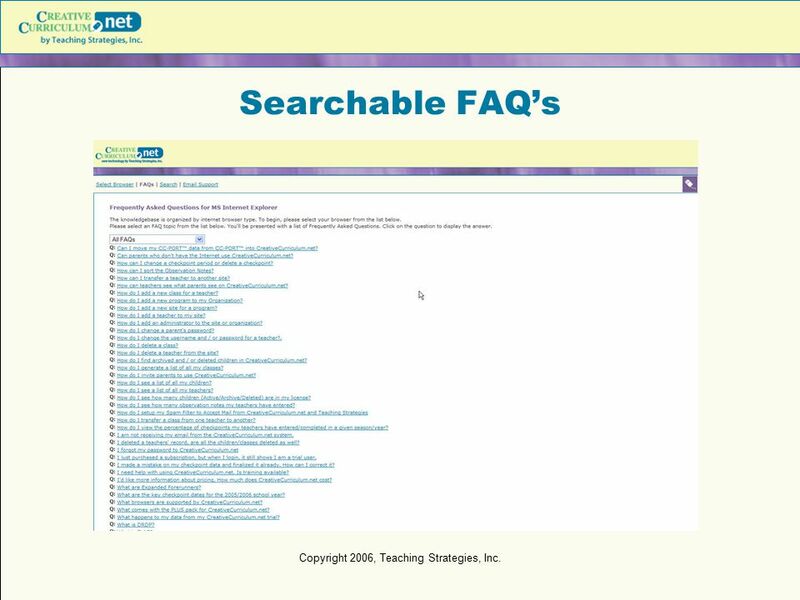 Copyright © 2010 California Department of Education, Child Development Division with WestEd Center for Child and Family Studies, Desired Results T&TA Project. 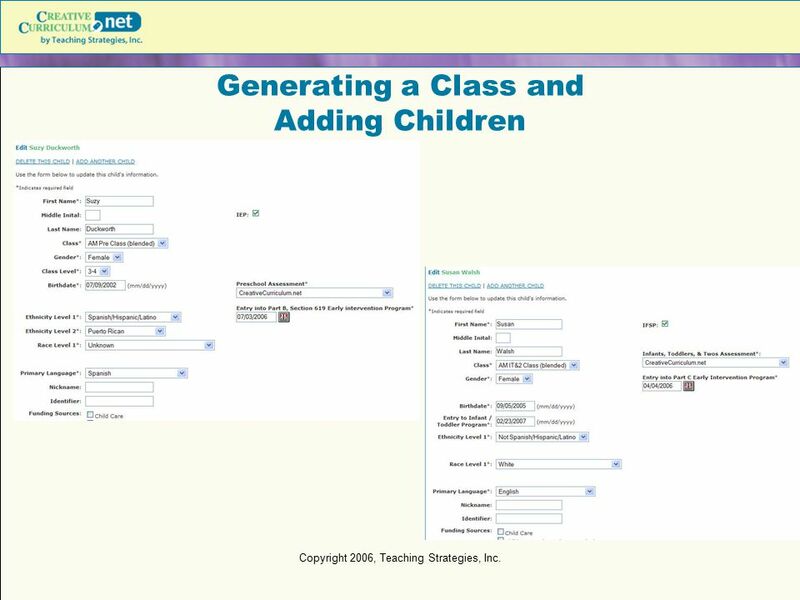 Delaware Building BLOCKS EARLY CHILDHOOD MONITORING – INSTRUCTION – ACCOUNTABILITY SYSTEM FOR YOUNG CHILDREN School District Meetings September and October. 1 Champlain Valley Head Start Child Outcomes Assessment in Champlain Valley Head Start. 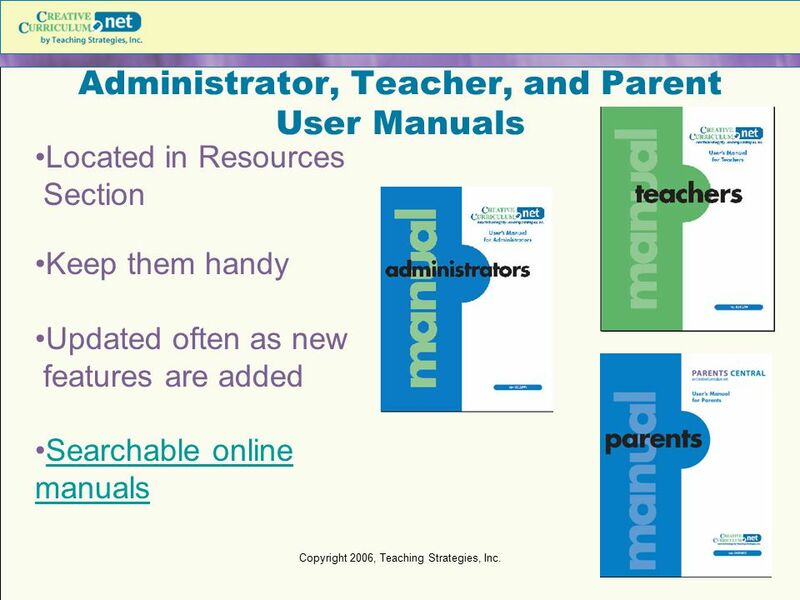 1 Early Childhood Assessment: Information for Early Childhood Program Administrators. 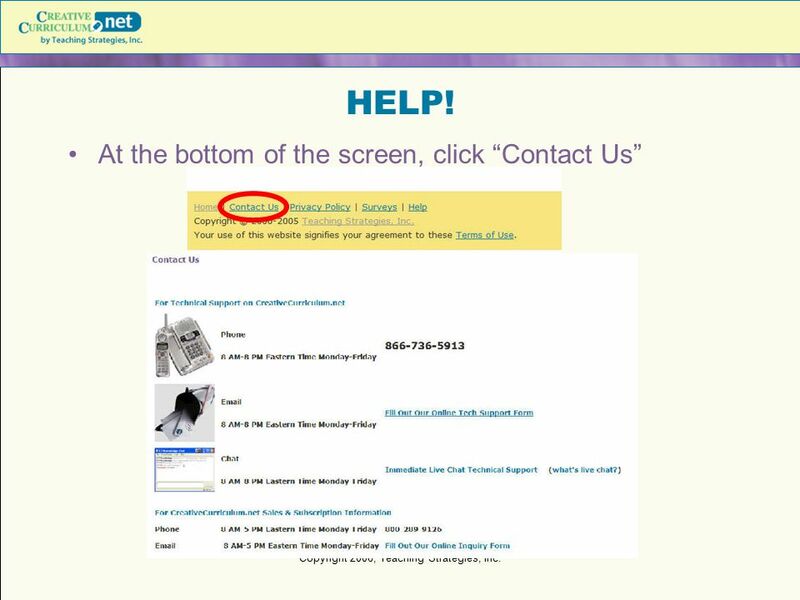 DAP or Not Activity With a partner you don’t know… Discuss what you think of as DAP or not. Kids Say the Darnedest Things Anecdotal note taking in the real world. 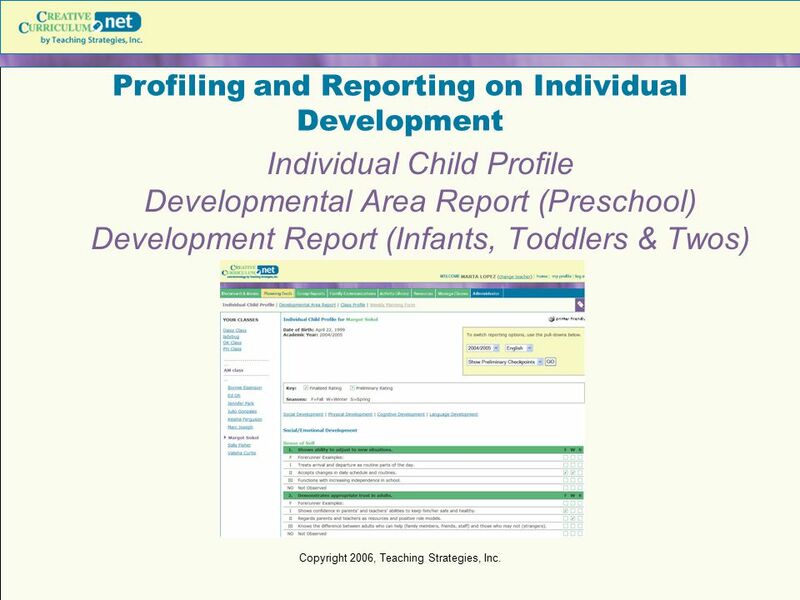 Desired Results Developmental Profile - school readiness© A Project of the California department of education, child development division. Florida Kindergarten Readiness Test Training for Reading Coaches and Non-Public Schools Fall 2014 Colleen Risner. 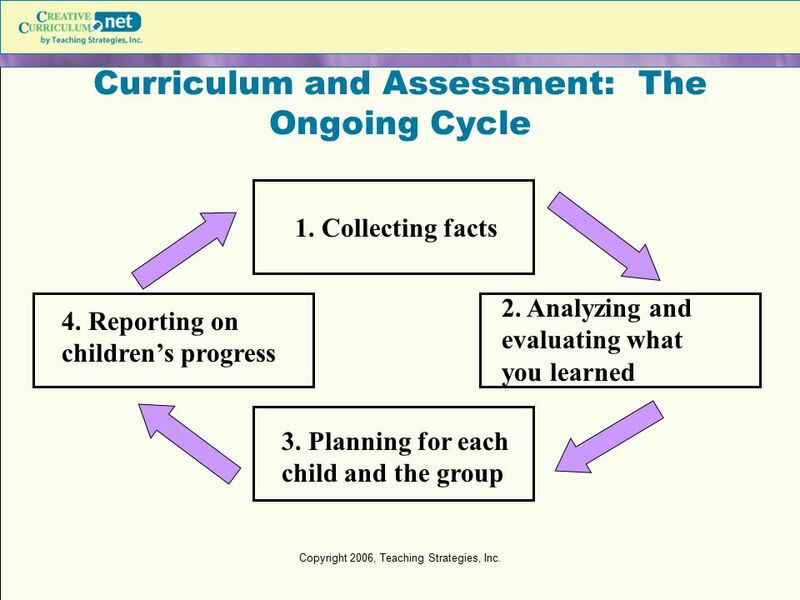 Illinois Early Learning Guidelines (IELG) Trainer Notes: (Please show this particular slide prior to the session and as session starts) 2 minutes It. Sheldon ISD’s Early Learning Center Count down to opening. 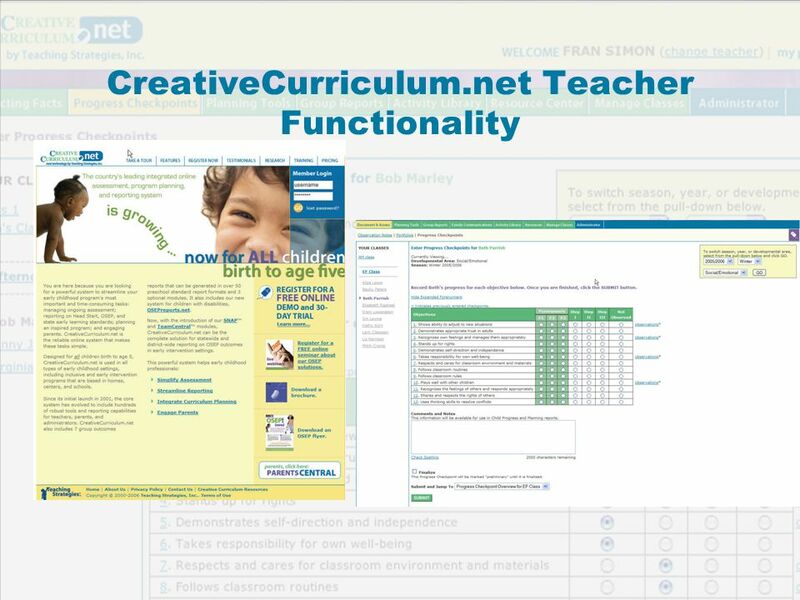 CE300-Observation and Assessment in Early Childhood Unit 2 Using Standardized Tests and Authentic Assessments Feel free to chat with each other. We will.